My Domestic Monastery: Five Favorites - favorite shows for kids! Five Favorites - favorite shows for kids! I'm guessing I'm not the only kid of my generation who grew up with a love for Mr. Rogers! The quiet, gentle predictability of knowing just when he was going to zip up that sweater and tie up those shoes, the happiness of knowing we could count on the trolley to take us off on adventures...loved it! I was kind of sad that my daughters were going to miss out on that, until Daniel Tiger's Neighborhood debuted. It has a lot of the characters we loved in Mr. Roger's neighborhood, some of the same songs, and the same gentle, inviting pace. And let's face it...I always wanted to get to know Daniel Tiger and his friends a little bit better, didn't you? I will forever love Charlie Brown. I don't remember a time in my life when I didn't love him! Charlie Brown cartoons are wonderful because they seem to operate on two levels - a child's level and a parent's level. Some of the ones I watched over and over again as a small child I have a new appreciation for as a parent (and, let's face it, some of the best jokes on there are cultural references only an adult would get). Classic. This one comes with a slight caveat. I grew up in the Shining Time Station era of Thomas the tank engine, and it's just really hard to top Ringo Starr's narration. (My dad was a huge Beatles fan, but for most of my childhood I knew Ringo as Mr. Conductor, not as a former Beatle.) But, I do like the old school Thomas and friends one - the live action animation era (much like what I grew up on). As Anne of Green Gables would say, "There's more scope for imagination!" I am NOT a fan of the computer animated Thomas episodes, but I'll gladly watch the pre-computer animation era with Sister Stinky! 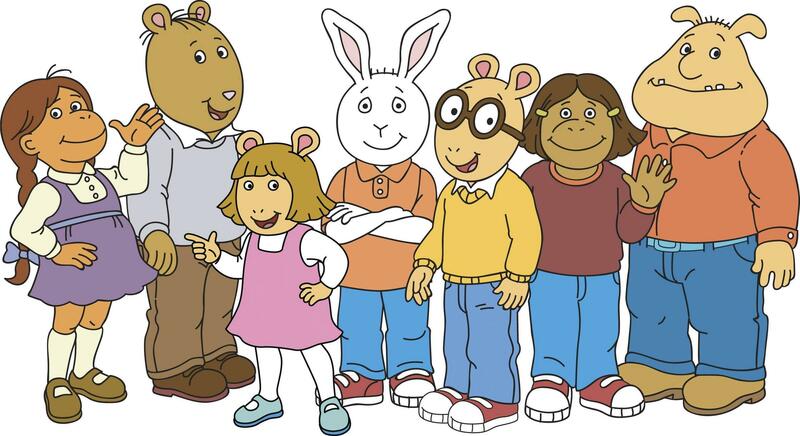 Arthur was the kind of show that almost made me look forward to staying home sick from school when I was growing up. I watched when I was waaaay too old for it, and then I watched it some more. Sister Stinky doesn't opt for this show as often as I'd like but I LOOOOVE watching it with her when she does! So great because the characters work through all kinds of different dilemmas but really set a good example for how kids should tackle everyday problems. You all better believe I saved the best for last!! I could watch the EWTN show The Friar morning, noon, and night and never get sick of it!!! I have to confess I've only seen one or two episodes of this gem, introduced to us by my dad, but I LOVE it. A friar and some of his favorite puppet friends and an occasional visit from their favorite nun friend? Um, yes please!! The show is out of Spain so there is definitely some dubbing action going on but it doesn't take away from the awesomeness of this show one mite! You can't watch the episodes online, unless you catch them on EWTN's livestream (hence why I've seen so few, since our family is cable-TV-less) BUT you can buy them through EWTN's online catalogue and it is my goal to try and acquire every single one!! So far we have zero, but you better believe these DVDs will be on our Christmas list!!! What children's shows do you find tolerable or...dare-I-say...enjoyable to watch?! Little Einsteins....octonauts and doc mcstuffins are decent and i enjoy sophia the first, but really, little einsteins is the only one that is geared for my guy's age group! Oh my goodness...totally forgot about Little Einsteins! That one is pretty cute, too! We love Busytown over here. thanks for the suggestions!! Sister Stinky loves Busytown, too, but I can take it or leave it depending on the day, haha. My goddaughter is OBSESSED with Brother Francis! We borrowed one of the DVDs from them, and I'm pretty sure our girl's love of Pope Francis is somehow tied in with her love of Brother Francis! I feel the same way about Arthur! It is so weird to hear the different narrators voices on Thomas. The weirdest is George Carlin! We own a ton of Thomas DVD's and my only complaint about Curious George is my fear that my children will start talking like George haha. Oh man, I didn't even think about that possibility! George's "talking" definitely drives me crazy! !